Every time a user buys something from you, this creates an "order" record. The order holds all the details relating to a checkout process, including a unique reference number, any promo codes used, the affiliate who referred them & fraud check results (if enabled) etc. Orders are not created for renewals, as those don't involve a new checkout process - simply a recurring invoice for a previous order. Orders always remain pending until admin review, even though the items inside them will auto activate (if set to), allowing your staff to review and process all the new orders you receive and run any manual checks or actions you deem necessary for new purchases. All orders are assigned two unique numbers, first the ID Number which is an internal reference used by the system, your first order will be ID 1, the second ID2... They are also assigned an Order Number (or Order #) this is the number your clients will be given at the end of the checkout process and is a randomly generated 10 digit number - this won't divulge the size of your company. The Order Items section lists each of the products, services and domains the client has ordered alongside the Status and Payment Status, providing at-a-glance reference to whether the account has yet to be created or payment received. If products are in pending status as in the screenshot then a number of text fields, dropdowns and checkboxes will be displayed. For more information on these refer to Accepting Pending Orders below. If enabled in General Settings the Notes / Additional Information are displayed here if the client provided any when placing the order. Accept Order - Refer to Accepting Pending Orders below. Cancel Order - Sets the order status to Cancelled, runs module termination for any active products in the order (removing accounts from the server and setting the product status to Cancelled) and also sets the invoice status to Cancelled. Cancel & Refund - As above but also refunds any invoice payment via the payment gateway (if supported by the module). Set as Fraud - Runs the module termination for any active products in the order, cancel the invoice and changes the order's status to Fraud. Set Back to Pending - Changes the status of products/services and the order to Pending status. Delete Order - Removes the order and everything relating to it - this option should only be used if you want to irrevocably remove the order from the system. This includes deleting the products/services within that order and the associated invoice. At the bottom of the Orders page are a number of bulk management options that can be used to change the status of multiple orders in one go. These tools only change the status of the order, they do not run any module commands to provision/terminate accounts, that can only be done via the Order Details page. You can place an order by going to Orders > Add New Order. Note: An easier way than using the dropdown menu on the add order page to locate the client you want to add the order to is to locate the client first using the WHMCS intelligent search and then from the Actions menu on the Clients Summary page, just click the Add New Order link and the client will be preselected. Begin by selecting the client from the dropdown and choosing the payment gateway with which you want the client to pay. Select a promo code from the dropdown of activate promotions to apply a discount to the order. Any discount amount selected here will be applied to the order regardless of any requirements in the promotion configuration, when staff select a discount it is always applied. Next, choose the product/service and billing cycle. Here you can specify a quantity if you wish to add duplicates of the same product and specify a price override if you don’t wish to charge the standard product pricing. If the package comes with a domain, enter the users domain in the box provided. And if the domain is registered with you, you should select the "Register" option and choose any addons the user has for their domain. To add more products to the order click the “Add Another Product” link, this allows you to add a different product whereas the quantity option above would add exact duplicates. 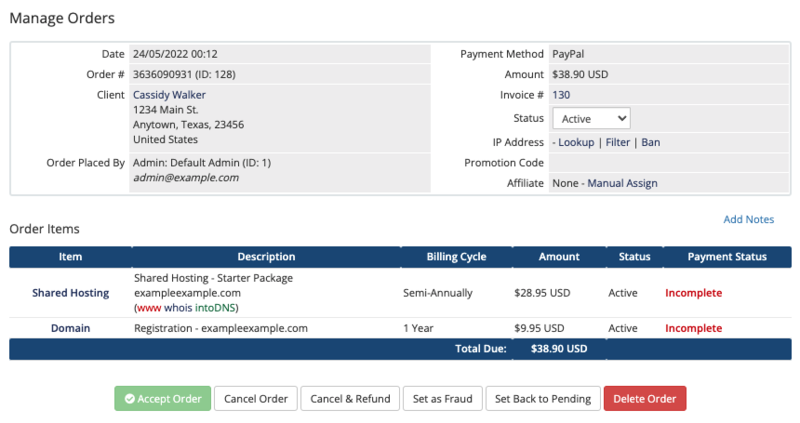 Send Email - Send the Invoice Created email template. Whenever an order is placed in WHMCS, it comes in as a pending order. To view pending orders, go to Orders > List Pending Orders and click the Order ID. From there you can accept or deny the order. If the order contains any products, you will see those listed in the order items and if the products are linked to a module, and the product/service has not yet been activated (for example by auto activation on payment) then you'll see the options to select a server to install it to, define a username & password, tickbox to create the account and tickbox to send the welcome email. Ticking the "Run Module Create" box will run the associated module creation command when you accept the order. If the order contains any domains, and they haven't been activated by an automated action on receipt of payment, then you'll also have the option to choose a Domain Registrar and tickbox for "Send to Registrar" to define if you want it to be submitted via the API. You'll need to do this if you don't have automatic registration enabled or are wanting to register/transfer the domain without payment. It is important to note that while all orders are pending until activated, the items in that order - hosting accounts and domains - will be automatically activated based on your auto setup options and auto registration options. So if you have them set for instantly upon payment that will be done while the order remains pending. This is to ensure you manually review each order you get. If you use the MaxMind service, then you might want to check the results sent back from MaxMind regarding an order. You can do this from the order details page. You get to that by clicking the Order ID number for an order next to the order in the list of orders. You will then see an option labelled "Fraud Check Results" which will list what was received back from MaxMind regarding that order. If you decide that the order was infact not fraudulent, and you want to therefore manually overide the fraud check, you can do that by clicking the Set Back to Pending button which will change the order status from Fraud to Pending and the invoice back to Unpaid. This then allows the user to go ahead and make payment from the client area as normal, or if a merchant gateway is in use, you can click through to the invoice and instantly attempt to capture the clients payment using the Attempt Capture button displayed on the invoice. Note that if an order's fraud score is over your setting's threshold it will skip the 'Pending' status and be set to 'Fraud'. As standard there are 4 order statuses which should cover most situations; Pending, Active, Fraud and Cancelled. Should more be required they can be created via the Setup > Other > Order Statuses Page. More information can be found on the Order Statuses page.